Disclaimer: If you think this is going to be an article about eating sugar-free candy and throwing out your good stuff like Skittles, Reese’s Peanut Butter Cups, you are dead wrong. Each year as Halloween approaches I see a bunch of dental blogs put out articles titled something like “The Most Dangerous Halloween Candies for Your Teeth.” I presume that most of these have been written by marketing people who work for dentists, and inevitably they all say the same thing and copy each other year after year. Here’s the real truth about Halloween candy’s threat to your teeth: it’s no more dangerous to you than the stuff you eat any other day of the year. All those other articles you can read on the internet will tell you to avoid sour and sticky candies, and substitute the real stuff with sugar-free treats. While it is true that sour candies decrease the pH of your mouth (make it more acidic and cavity-promoting) and sticky candies can attach to your teeth and provide a prolonged sugar exposure, you need to understand something about the decay process: any fermentable carbohydrate will cause cavities and anything acidic will speed up that process! The list of foods that promote dental decay is way too long to list here, but suffice it to say it includes most fruits, anything with sugar, and anything with flour. I dare you to name a meal you’ve eaten, or a snack you’ve fed your kids, in the last week that doesn’t have something from that list. And here’s the real kicker: any quantity of fermentable carbohydrates causes cavities; even if it’s a just a few croutons from a salad you ate, you’ve put yourself in a decay-causing situation which is accelerated by the acidic cherry tomatoes that were also on the salad. I’m not saying that some things aren’t worse for your teeth. Of course a meal of Pixie Sticks and Tootsie Rolls is worse than most things you could eat, but the real issue is not the kind of food consumed, it’s 1) how well you clean your teeth, 2) how frequently you clean your teeth, 3) how often you expose your teeth to cavity-causing things, and 4) whether you have an underlying condition (such as dry mouth) predisposing you getting cavities. 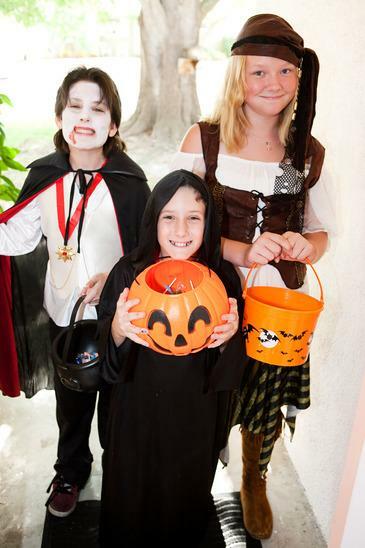 Don’t let your kids hoard candy. If they have a stash that they’re dipping into several times a day for months on end, that is a pretty huge cavity risk. Try to eat candy with meals—such as for dessert. Avoid eating sugar sporadically throughout the day. The worst mouths in the world are those that sip on a 128 oz Mountain Dew throughout the day. Don’t mimic their bad habits with your Halloween candy. Brush and floss. Do it well and do it regularly. Most of you aren’t flossing and a large percentage of you don’t spend enough time brushing. Just do it. If you can’t brush and floss, at least drink some water to wash away some of the sugar. Don’t waste your time with Smarties, Dots, Nekkos, Good & Plenty, candy corns, and fruit flavored Tootsie Rolls. If you’re going to binge on sugar, at least do it the right way. You can do much better than the above mediocrity. Focus on the Reece’s Peanut Butter Cups, Whoppers, Snickers, Milky Ways, Peanunt M&Ms, Kit Kats, and Twix Bars. These are the target items. If a dentist hands out toothbrushes, floss, or sugar-free anything, please toilet paper their house. That is lame and the consequences are well-deserved. Above all, don’t even think about going near those awful orange and black wrapped things. I don’t know which circle of Dante’s hell these come from, but I’m guessing it’s at least the 6th or 7th. Does anyone even know what they are called? When a manufacturer is too ashamed to even put its name on the product wrapper, this should be a major tip-off to avoid the nastiness inside.